Red star painted in front. If you want to be a superhero then everyone knows that you’ve got to have the absolute best accessories. Sometimes all you need is a beautiful red cape like Superman. Others, like Batman, prefer an entire arsenal of gadgets and doodads. Now, we know what you’re thinking, ‘how on earth will I know what accessories to add to my super uniform?’ Well, don’t you worry your heroic head about it, we have just what you need! 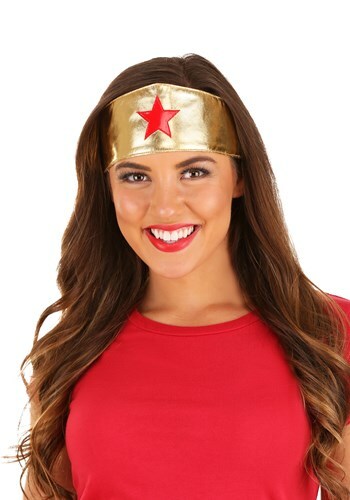 Check out this awesome Women’s Superhero Headband. Once you toss this golden band around your head you’ll feel super powers flowing through your veins. You’ll feel more than ready to go out and start saving the day, one after another. However, before you fly into action, make sure you look through the rest of our superhero accessories. We know you’ll be able to find even more fun props to add to your heroic new look!